No… not sweets! The washer/dryer. But more on that later. Last night the phone was displaying a signal strength of four bars (maximum is five bars) but there was a small letter ‘R’ above the bars and whilst we could make voice calls there was no internet. I’ve looked at the phone manual and the ‘R’ means “Roaming outside normal service area”. So there was a good signal strength for voice but perhaps from another provider? No data connection was available from Three. When we moved off the mooring this morning and went through the bridge hole to the services block the data signal returned and our emails started flowing to the phone. When I was developing the specifications for Waiouru I made a decision not to include an Electrolux Travelpower unit. These produce 3500 watts of 240 volt electricity from a third specialist alternator connected to the engine. My logic was that they were developed in a time when large 12v DC alternators either didn’t exist, or were very expensive. The cost of the Travelpower unit was approximately £3000. Waiouru’s Beta 43 has two alternators as standard. They are a 175A and 50A. The output of the two alternators can be combined to provide a theoretical maximum output of 225A. Instead of the Travelpower we specified a Smartbank Advanced system which combines the output of the two engine alternators. To increase the domestic alternator output (the 175A) a Sterling PDAR was specified. The PDAR increases the alternator voltage output to 14.8V. It also runs routine desulphation cycles on our wet cell traction batteries. The last item in the specifications were the six 450VA flooded wet cell traction batteries. The laundry strategy was to only use the Candy when the engine was running and the batteries had completed the initial “Bulk” charging stage and had moved to the “Absorption” charge. The Bulk charge takes approximately 25 minutes to complete with Waiouru’s current setup and our usual evening electrical usage. So we turn on the inverter and start the Candy after the engine has been running for 25 minutes. If the Candy requires more electricity than the engine can produce from the two alternators then the additional power will come from the batteries. My calculations back at the design stage suggested the alternators should be sufficient. When the engine is running during the charging “Bulk” stage the actual combined alternator output is 168-170 amps verses the theoretical 225 amps. So there was no requirement to go to the expense of fitting a Travelpower unit. The engine is capable of producing the required electrical power without it. Yesterday I noticed the rear end of one bow sausage fender (my name for them) had started to fray because the rope has been rubbing between the hull and the bank rather than the actual fender. 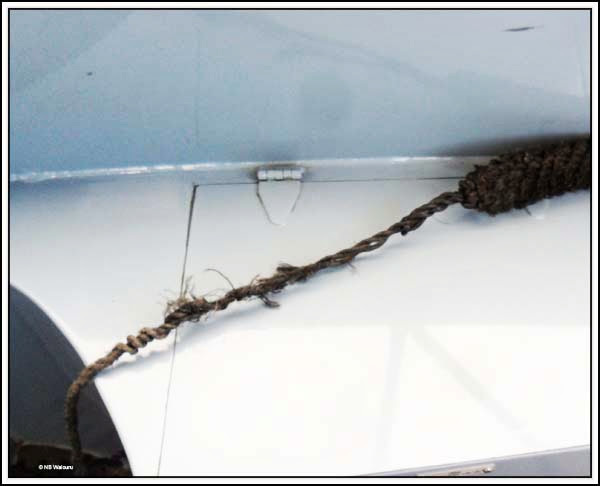 If no remedial action is taken then the rope will severe and the fender will likely be lost. I don’t have any spare rope but have a strategy to rectify the problem. The first task was to collect some tools. 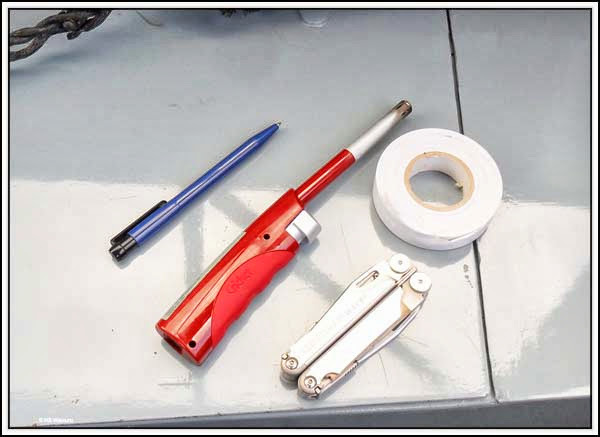 The pen will be used to force the strands of the rope apart and the galley gas igniter will be used to burn/melt the cut ends of the strands preventing them from fraying. 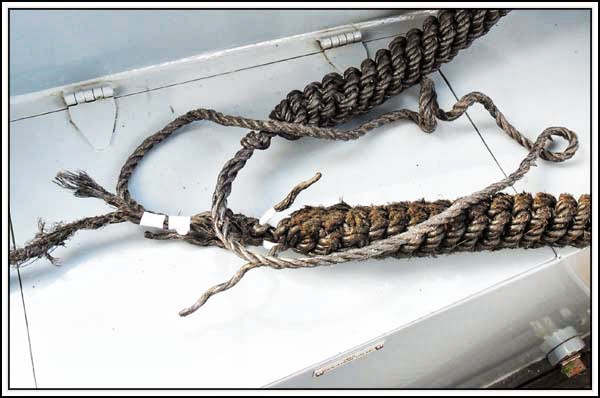 The tape is used to hold the strands together when the rope is cut and burned. The fenders came with a relatively long length of rope at ether end and my plan is to back splice one end onto the other. This will create a loop which I’ll then cut in half leaving the fender with a shorter length of rope at either end. The ‘good’ end has now been back spliced into the frayed end. 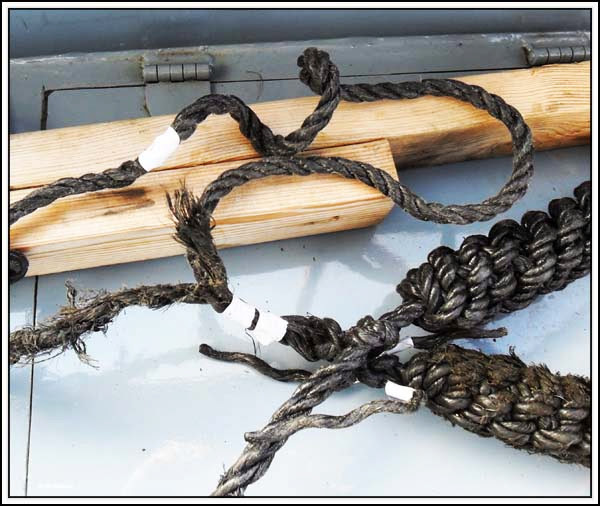 I’ve taped all the frayed and cut ends prior to splicing the rope. The splice has been completed and I’ve wrapped some white insulation tape around the rope in the middle of the section (upper left in the above photo). The rope was then cut through the middle of the tape and both ends were burned with the gas igniter. All the frayed ends were then cut and burned. 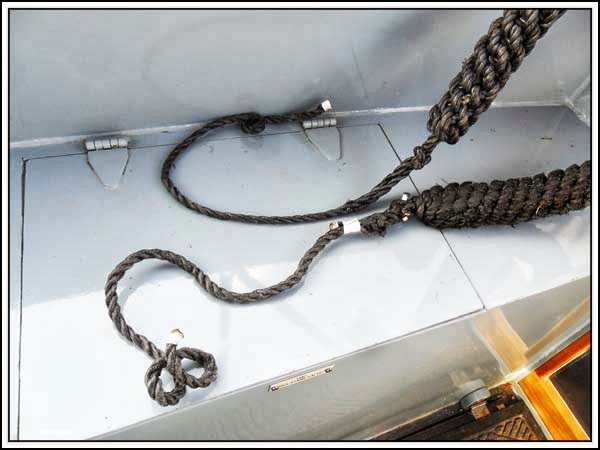 The shortened lengths of rope are just of sufficient length to secure the fender back on the bow ‘cheeks’. Rest day tomorrow. I’ve already planned a local walk! much less electricity used that way. Jan usually does a cold wash and lets mother nature do the drying. However it was a cold, wet day and I needed my jeans so she was forced to use the dryer. It's the drying cycle that uses the most power! I have that same problem with my Sony android phone on three. I have found that after a power off it usually restarts OK. Yes, that usually works for use as well. But unfortunately it didn't work on this occasion!